Pine Grove Motel is situated 35km south of Fox Glacier and 90km north of Haast on State Highway 6. It sits in an area well known for its lush rainforest, numerous rivers and beautiful beaches. Pine Grove Motel is a favourite location for those travelling through the West Coast and is the closest accommodation to the Copland track. The West Coast is unique to New Zealand and Pine Grove Motel is at the heart of the best nature and scenery in the region. 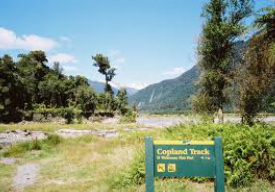 The Copland Track is an excellent overnight tramping walk into Westland's spectacular forest, river and mountain scenery, while hotpools at Welcome Flat are an added attraction. You can read more about the Copland Track on the Department of Conservation site here or read the pamphlet here. Pine Grove Motel is 8km south of the start of the Copland Track. The Westland Tai Poutini National Park covers an area from the highest peaks of the Southern Alps to the wild and isolated beaches of the West Coast. With the 130,000 hectares of area you will find glaciers, lakes, hot pools, wetlands and beaches. You can explore the area online and plan your trip with the helpful Department of Conservation guide by clicking here. Fox Glacier is a top New Zealand attraction. Enjoyed all year round we are happy to advise you on your options for exploring this natural wonder. We are able to book guided walks and flights for you. There are a number of trout and salmon fishing rivers within 20 minutes drive. The Salmon Farm Cafe at Paringa (25km south) is open daily for breakfast and lunch and sells a variety of fresh and smoked salmon.